It was definitely a hot spot. 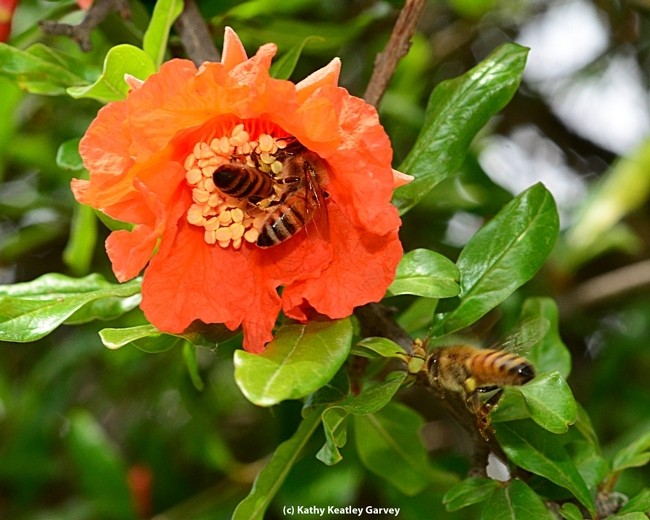 Honey bees foraging last week on a pomegranate tree on Hopkins Road, west of the UC Davis main campus, competed for food on hundreds of blossoms. 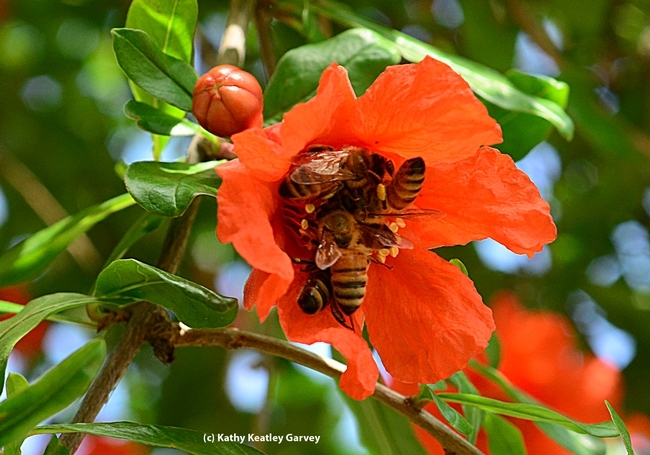 We counted five honey bees on one blossom alone in what amounted to a pushing/shoving match. Most of the bees probably came from the nearby apiary at the Harry H. Laidlaw Jr. Honey Bee Research Facility on Bee Biology Road, off Hopkins Road. The pomegranate is an ancient fruit and the honey bee is an ancient insect. Millions of years ago, they grew up together in the Mediterranean region of southern Europe. 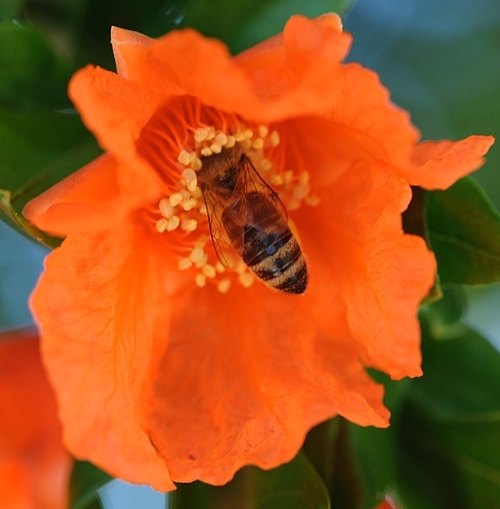 European colonists brought the honey bee to our Eastern coast (Jamestown colony) in 1622; honey bees finally arrived in California in 1853. 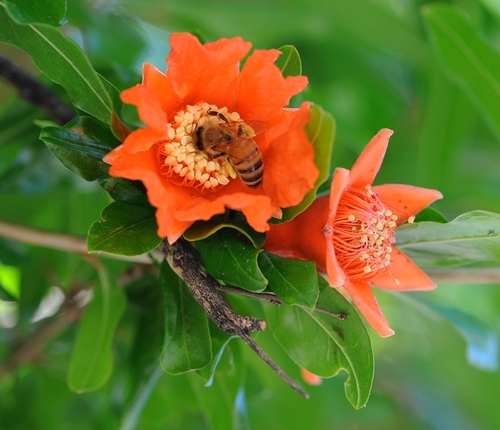 The pomegranate trees were introduced to California in 1769. 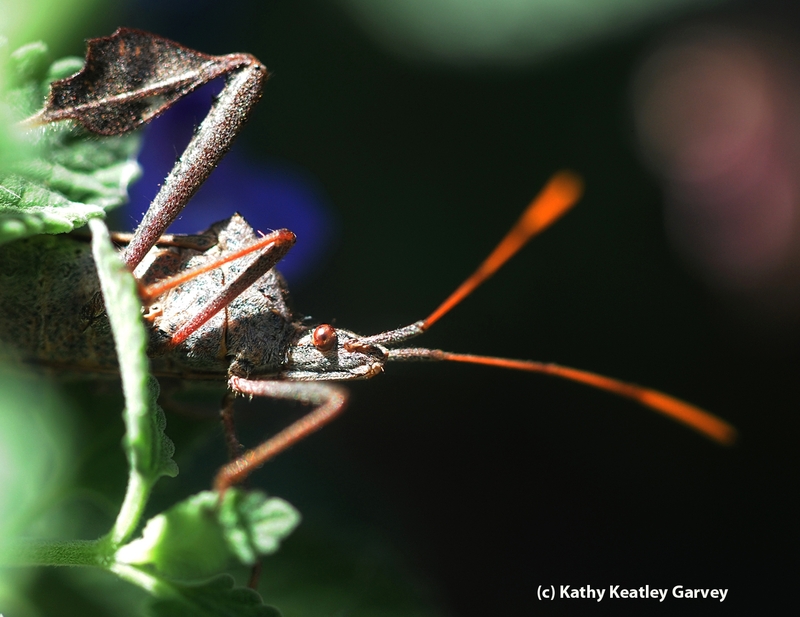 When you first see the leaffooted bug, you know immediately how it got its name. The appendages on its feet look like leaves! This morning we saw one in our catmint (Nepeta) patch. It crawled beneath the tiny leaves, sharing space with honey bees, European wool carder bees, butterflies and assorted spiders. Tonight scores of them stormed our pomegranate tree. In fact, they made the immature fruit their kitchen, living room and bedroom. 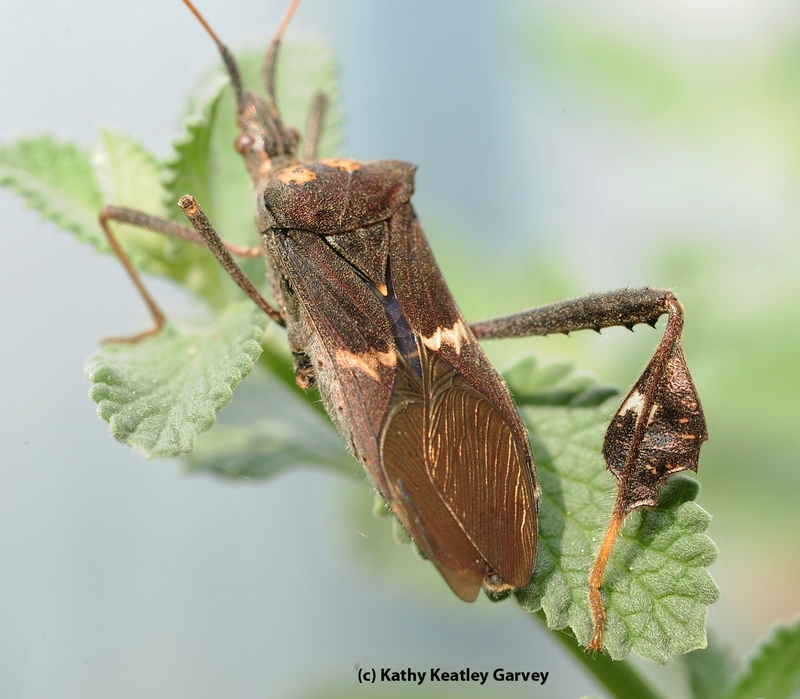 Although the leaffooted bug (Leptoglossus clypealis) is a pest of pistachios and almonds, we've never seen it on our pomegranate tree until today. Our tree, planted in 1927--back when Herbert Hoover was the U.S. president--has few pests. One year white flies attacked it mercilessly. Tonight leaffooted bugs claimed squatters' rights. The adult bug is about an inch long with a white or yellow zigzag across its back. Shades of Zorro! Its most distinctive feature, however, are the leaflike appendages on its feet. 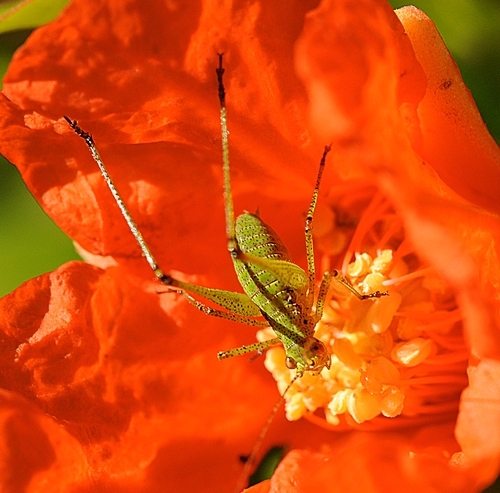 Back in 2009, integrated pest management specialist Frank Zalom, professor of entomology at the University of California, Davis, co-authored UC IPM Pest Management Guidelines on the leaffooted bug as it pertains to almonds. 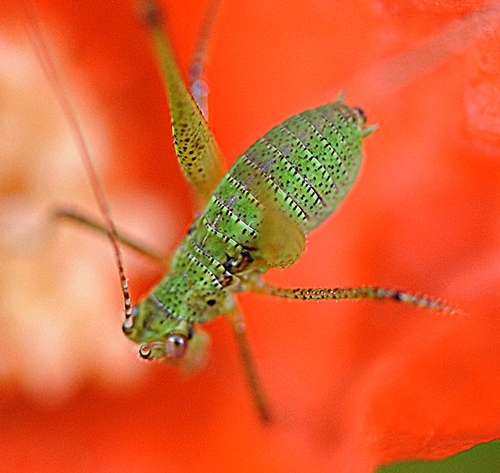 Zalom and his colleagues called attention to their needlelike mouthparts. The adults feed on young nuts "before the shell hardens." And after the nut is developed, "leaffooted bug feeding can still cause black spots on the kernel or wrinkled, misshapen nutmeats." 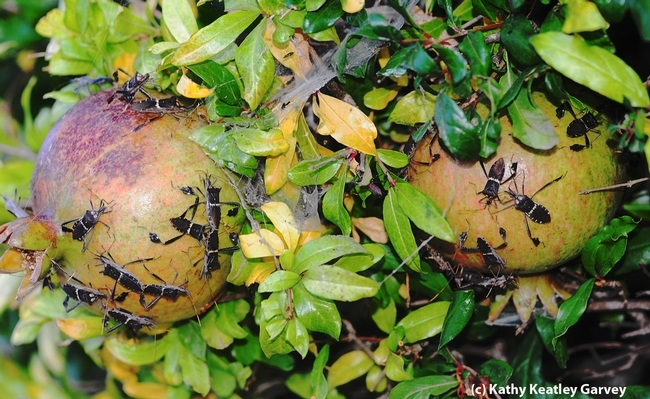 As for our pomegranate tree, we're not sure how well these leaffooted bugs can probe the tough, leathery fruit. You'll be hearing more about the CP2C. The first-ever Congressional Pollinator Protection Caucus. In keeping with 4th Annual National Pollinator Week, June 21-27, the Pollinator Partnership announced today that both parties of the U.S. House of Representatives have agreed to form the first Congressional Pollinator Protection Caucus (CP2C). Co-chairs are Rep. Alcee Hastings (D-FL) and Rep. Tim Johnson (R-IL). Hastings and Johnson said they will be sending a “Dear Colleague” letter to fellow members of Congress to encourage their participation in the caucus. As Hastings so accurately stated: “With one out of every third bite of food we humans consume dependent on bees and other animals for their pollination services, legislators need accurate information to help inform their positions." “The caucus," Johnson added, "will seek out the best of pollinator science, economics and best practices." Said Laurie Davies Adams, executive director of the Pollinator Partnership (P2): "This bi-partisan effort aims to support legislators’ understanding of the needs of their constituents with respect to pollinators, and we salute their cooperative drive to ensure that this issue gets the attention it deserves." Kudos to Hastings, Johnson and the Pollinator Partnership. 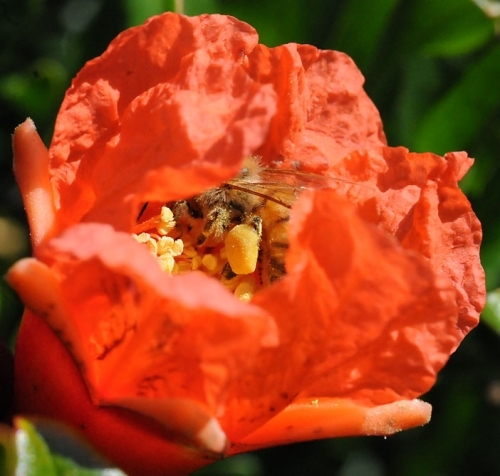 Meanwhile, in conjunction with the CP2C launch, the Pollinator Partnership will host a briefing for members of Congress, staff, and the public on Thursday, June 24 at 3:30 p.m, at Longworth House Office Building, Room 1302. 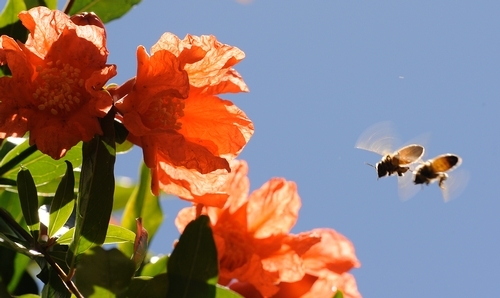 Burt's Bees is also a strong pollinator-supportive business. 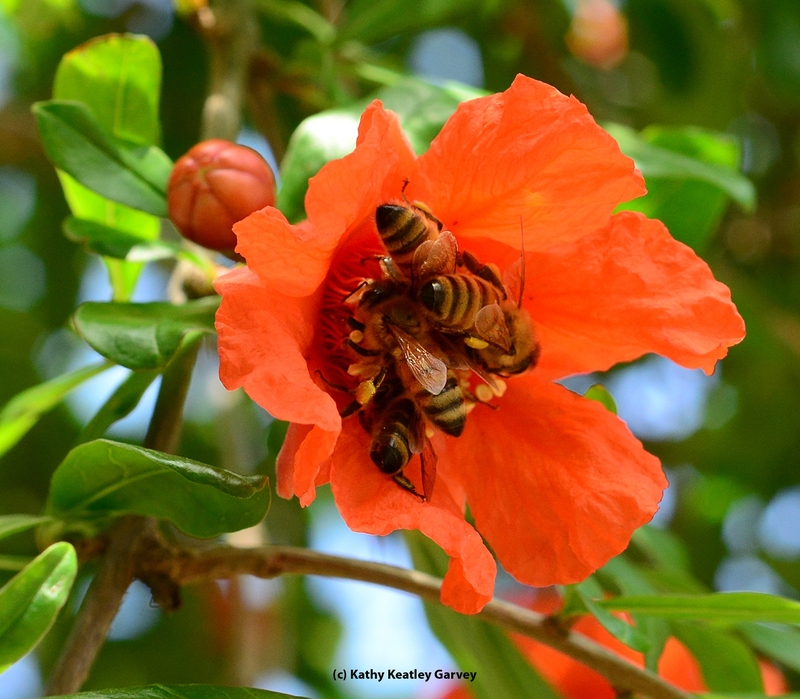 Through research, public awareness, and concerted actions, we can all help preserve and protect our pollinators, especially honey bees.